Officially opened on October 5th, 2016, Autodesk’s BUILD Space champions fabrication for the AEC space. StrucSoft’s MWF automates the placement and details of the framing in Revit®, detects and resolves clashes of framing against MEP and structural members, creates shop drawings, BOM & more. MWF can then export the framing data to CNC rollformers such as Howick, bringing Revit®-based information into the fabrication environment. "With technology becoming more and more integrated into everyday construction processes, it is remarkable what MWF has done to automate the light gauge modeling and panelizing process. After modeling the light gauge panels using MWF, the panels were seamlessly exported to the Howick machine pre labeled, notched, and cut with almost no extra work. The panels then easily snap together with pre-drilled holes for screws. It is easy to see the power of merging manufacturing with the construction of light gauge walls by utilizing MWF software." 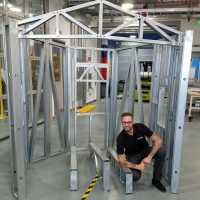 To see MWF in action, pulling production-level framing data from the Revit® model to the Howick FRAMA 3200 smart technology roll-forming framing machine in the BUILD Space, please click the following link: https://youtu.be/VBK9JdH5Fo0 .